Wilmington- Charter Day School, Inc. (CDS, Inc.) Trustees received the regular briefing on their family of four tuition-free, open enrollment charter schools. The reports included enrollment and demographic numbers, as well as detailed accounts of academic and financial performance. “The reports revealed that in student demographics, test scores, and taxpayer value the schools surpassed averages of traditional public schools in the state and districts,” stated Board Chairman John J. Ferrante, Esq. The student demographic makeup of the schools shows that 12% to 15% of the students have special needs, and over 35% are economically disadvantaged. 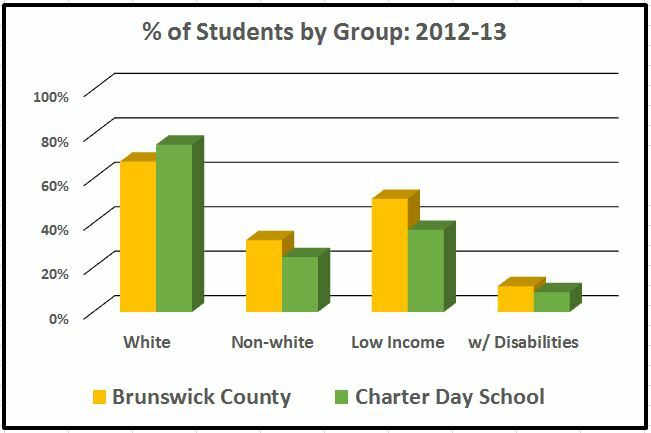 For example, Columbus Charter School, in Whiteville, serves double the percentage of Special Education or Exceptional Children (EC) than do NC traditional public schools when combining the students with Individual Education Plans (IEP) and accommodations under Section 504. In comparing the Leland charter school with the district, the student groups are seen to be comparable in the accompanying graph. 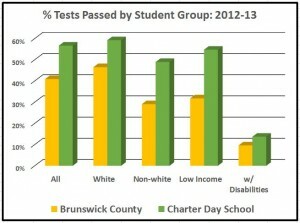 Regarding test scores, in the most recently published official End-Of-Grade (EOG) score reports for 2013, Charter Day School in Leland scored higher than Brunswick County Schools by 11 percentage points in Reading and 20 percentage points in Math. While official numbers have not been released for 2014, the preliminary state report projects a continuing 4.5% performance increase. Also pending the release of official results, Columbus Charter School in Whiteville reported that their EOG scores would again be the highest in Columbus and Bladen counties. Ms. Edwards of the Charter Day School Leland campus noted that every student group outscored the district’s schools by wide margins in 2013 and that preliminary scores from 2014 shows that trend continuing. Financially, each school’s per-pupil funding for 2013-14, as reported by the Headmasters, came in between $7,000-$7,709 per pupil. 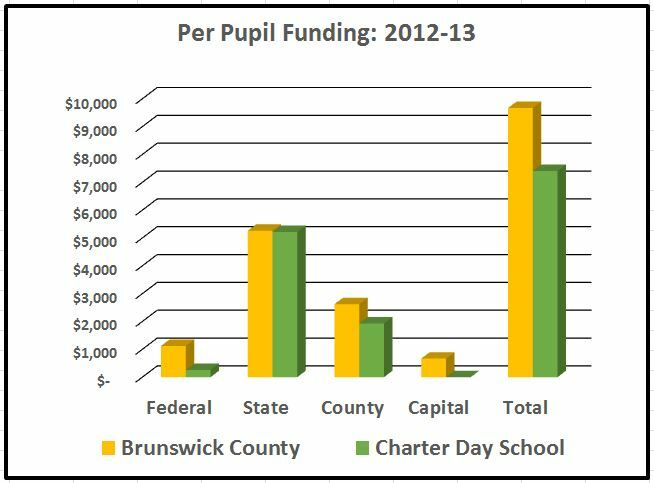 In 2013, traditional public school students of Brunswick County Schools received $10,156 per pupil according to Brunswick’s audit, and $9,265 per pupil in New Hanover County. Mr. Mark Dudeck, Treasurer, showed the comparison with the district in several funding categories as reported by DPI in his chart. Although receiving 27% less per pupil funds than district students, all schools in the CDS, Inc. family reported coming in under budget, both for last year and as projected for this year, which provides a second measure of evaluating the charter schools’ cost savings. The Schools of CDS, Inc. The family of established schools consists of Charter Day School in Leland with 920 students in K-8 and Columbus Charter School in Whiteville with 892 students in K-8. New schools in the family consist of Douglass Academy in Wilmington with over 90 students in K-3, and South Brunswick Charter in Southport at its first year capacity of 85 students in K-2. A July 2014 study published by the University of Arkansas which analyzed charter performance in North Carolina reveals that in NC traditional public schools’ average EC student population is 7.5%. 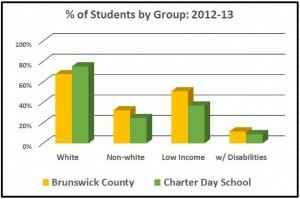 At the meeting, Charter Day School reported a 2013-14 student population of 12.12% with special needs. Columbus Charter School’s population, used in a previous example, was 15%— a huge and welcome percentage that has developed in only seven years, as the school opened in 2007 with only seven EC students out of 123 and now serves more than 100 out of 892. The most important insight to glean from the above numbers is just that—they are hard, measured numbers. They are empirical measurements of actual student populations, academic testing, and audited financial statements and not based on rumor or hearsay. The data presented at the open public meeting reveal that CDS, Inc. schools are surpassing state and county averages in areas of diversity, EC accommodations, test scores, fiscal responsibility, and therein, effectiveness. The schools believe their unique curriculum and instruction methods fuel these results. Baker Mitchell, President of the schools’ management company, outlined a number of enhancements to the schools’ classical curriculum at the meeting. The schools are continuing to increase the rigor of their classical curriculum that includes Latin as a required language course, re-emphasis on penmanship and cursive writing programs, and adding debate, drama, and public speaking components. Courses are organized on a history-based, systematic, four-year pattern which integrates all subjects. “It is a much nobler pursuit to teach our youth ‘how to think’ than to teach them ‘what to think’. I believe that is part of the Roger Bacon Academy’s philosophy, expressed in their motto: ‘Truth Survives’,” stated parent Johanna Eldridge in a recent posting on the school’s Facebook page. Mr. Mike Frank, Head of Curriculum Development related that teachers have been prepared for the transition by extensive in-service training and a restructured curriculum department which ensures that teachers are observed and coached at least once a month in each of the four core areas. This proactively ensures that teacher needs are met and curricula are being executed effectively and correctly.